A pattern for this quilt is available here. A few weeks ago I saw some scrappy 9 patch blocks start to pop up on Instagram (check out #scrappypostagestampQAL). Since I am always looking for a way to use up scraps, I thought I'd join in. After I posted my first blocks a friend commented that she really liked them. Since I know that this friend is expecting a baby girl (she already has 3 boys) I thought I'd make them into a baby quilt for her. I tried to stick with a little bit of a color scheme even though the quilt is scrappy and I used lots of pinks and peaches and corals with some purples and navies and blacks and greens. Pretty much all the colors actually. But I think it turned out pretty fun. Since this is going to a baby who lives in a place with cold winters and she is going to be born in February, I backed the quilt with AMH flannel. My favorite. The sashing is a Robert Kaufman white on white Spot On print and it so wonderful and soft and the binding is a Cotton + Steel basic. This is an awesome quilt! What a lucky little boy. Fabulous! Pretty and simple. Perfect for a baby girl! It looks really pretty. What size blocks did you use? Thanks! I really love these simple quilts. They are a bit old fashioned too....which my husband LOVES and considers warm and traditional. Thanks for sharing. It's perfect for a little girl. 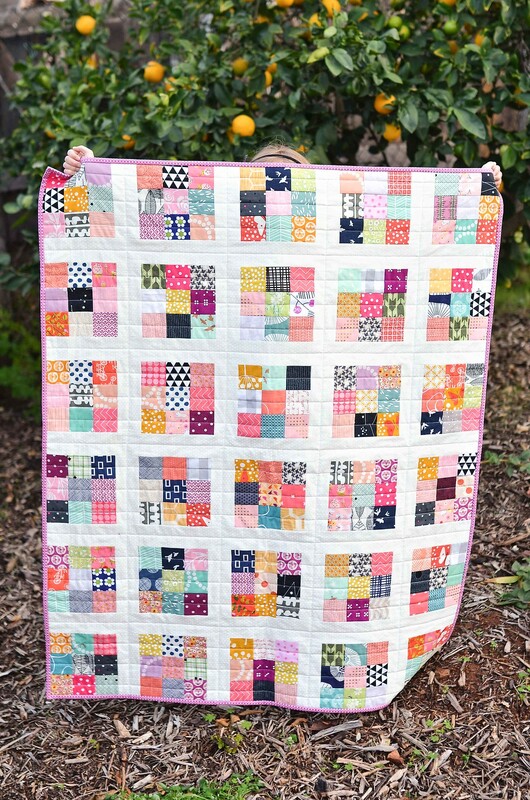 This is such a pretty quilt! It looks so dainty and girly - perfect for a baby girl. I love that you put flannel on the back! Erica, this is really beautiful. A lot of people do not like putting black in a baby quilt, but actually baby's vision is still very undeveloped and they respond well to black and white. This quilt is so pretty. This looks easy and fun. I think I could do this. Would you make a tutorial about the size of the sashing and such? It is such a sweet gift for your friend. Sweet, sweet, sweet! 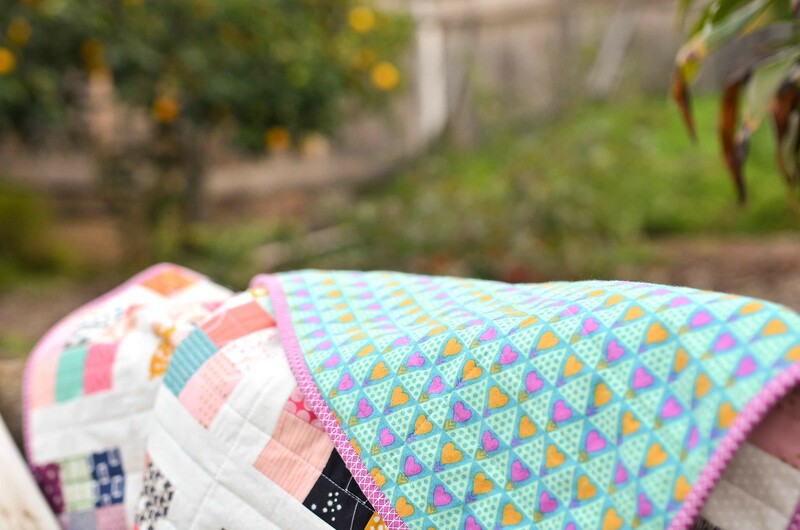 This scrappy little beauty is sure to keep that little gal snug as a bug. Love the mix of colours you used. And the flannel backing, too! Scrap quilts are the best. This is so pretty! I love the colors you used, it turned out wonderful! Such a pretty little quilt. Your friend and her new baby are sure to love it! !